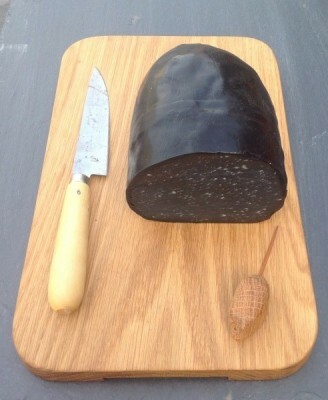 We have recently started to stock Char Coal Cheese on our cheese counter which is completely black. Despite appearances, the cheese is a smooth, delicious mature cheddar and adds a brilliant contrast to any cheese board. Despite looking like black pudding, the cheese has been selling extremely well since we put it out to taste. It is the first and only all-black charcoal cheddar cheese which is made with mature cheddar and blended with activated charcoal and comes from Yorkshire-based cheese producers Michael Lee Fine Cheeses – inspired by the coal mines. I was thinking it might be a good halloween dish of black pasta, with char coal cheese, washed down with stout?